When travelling from Athens to Corinth - a distance of about 80 kilometres - you leave Attica to enter the Peloponnese while crossing an Isthmus , a narrow and fairly low-lying, 6 kilometres wide, tongue of land which links Central Greece (Sterea Hellas) with the Peloponnese as well as with the east parts of the Saronic Gulf. 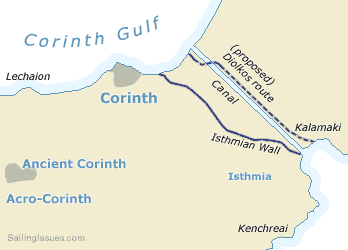 Both economically and strategically, the Isthmus of Corinth, as this narrow stretch of land is called, has played a very important role in the history of Greece. It is the only land bridge between the country's north and south. Populations, armies and commodities have got to move through it. How to get your ship from the Gulf of Corinth to the Saronic Gulf and vice versa? The question plagued the seafaring Greeks since very early times. 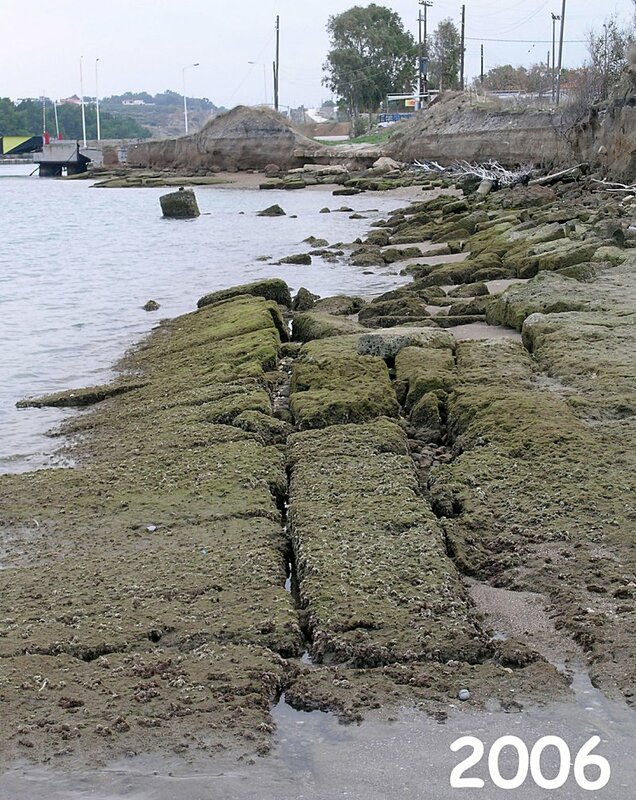 It was first solved towards the end of the 7th century BCE, or at the beginning of the 6th century, by a daring decision which led to the greatest of technical construction works in early Greece : the building of the Diolkos or Slipway. The course of Diolkos which is illustrated above is the one proposed by Raepsaet, yet Walter Werner and others suggest another route, which describes a large curve into the peloponnesian side on the modern canal, before ending in Kalamaki. Between 1956 and 1959, the Greek Archaeological Society carried out excavations designed to trace the course of the Diolkos. The greater part of the Slipway, which in fact ran all the way from the Gulf of Corinth to the Saronic Gulf, was brought to light. 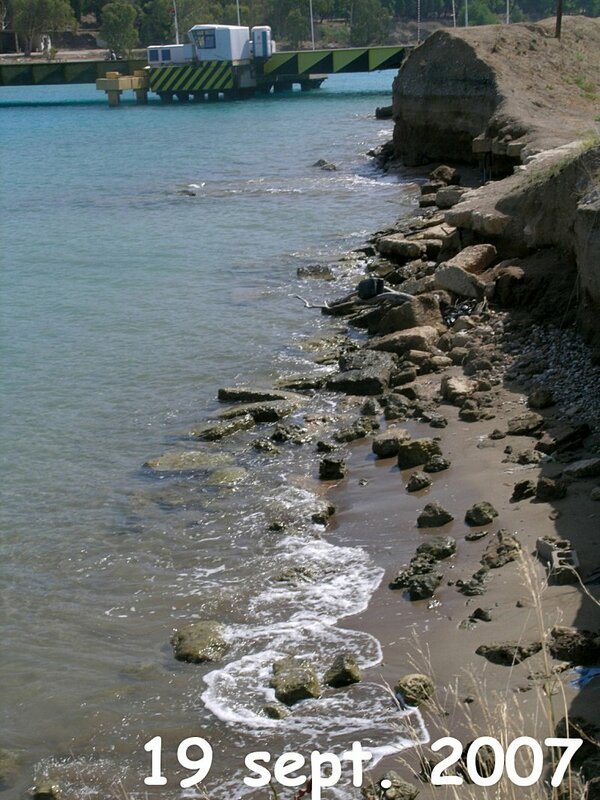 The Diolkos was a roadway with a width of 10 meters at the starting point on the Gulf of Corinth. The stone-paving began at the very edge of the sea. Ships were taken to this starting point and there dragged onto the Diolkos. These ships rested initially on wooden cylinders and were then transferred to a special wheeled vehicle. To reduce the weight of the ship as far as possible, it was unloaded before being hoisted onto the Diolkos and the unloaded commodities were taken by ordinary road to the other end of the Isthmus. Narrowing to between 3.50 and 6 metres after its starting point the Slipway was paved with porous stone throughout its length. 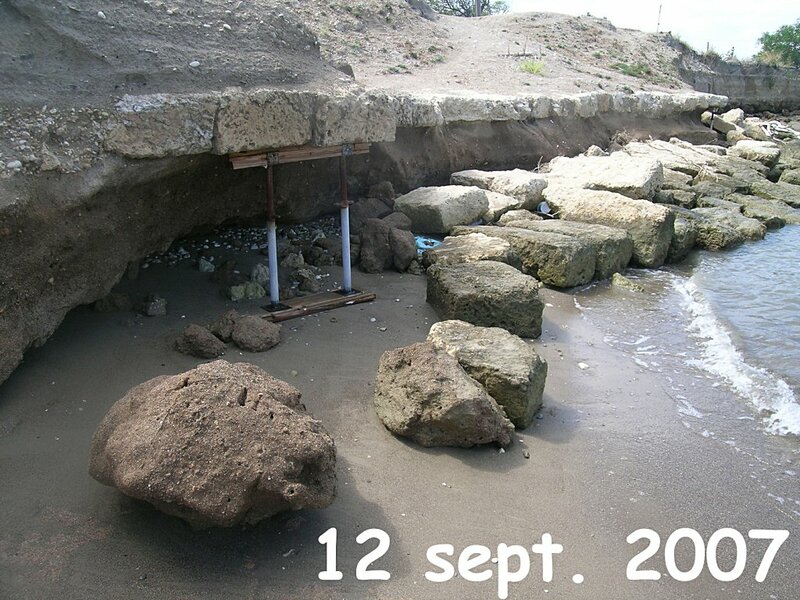 Two deep parallel grooves, which ran at a distance of 1.50 metres from each other, marked the Diolkos. Thus, the ship was dragged all across the Isthmus. On reaching the Slipway's terminus on the Saronic Gulf, it was lowered into the sea, the cargo was loaded again, and the ship continued with its journey. This arrangement did not merely speed up traffic. It also enabled ships moving between the Central and Eastern Mediterranean to avoid the rough seas almost unavoidable in a voyage round the Peloponnese. Sign the petition to save and restore the Diolkos !!! the necessary work force was gathered, and Nero in person started the digging with a little golden pickaxe. Three months later, however, Nero died, and the project was abandoned. Immediately after the liberation of Greece in the first half of the 19th century, the canal project was revived under Kapodistrias. Its execution hung fire until 1882, when a French firm took the work in hand. It was a Greek firm which completed it in 1893. The Corinth Canal is 6,343 metres long. Its width amounts to 25 metres, its depth 8 metres and the earth cliffs flanking it reach a maximum height of 63 metres. Two large bridges - one for railway, and one for the National Road, both of them rebuilt after World War Two - now link Central Greece with the Peloponnese, while below them fairly large ships are piloted directly from one sea to the other. 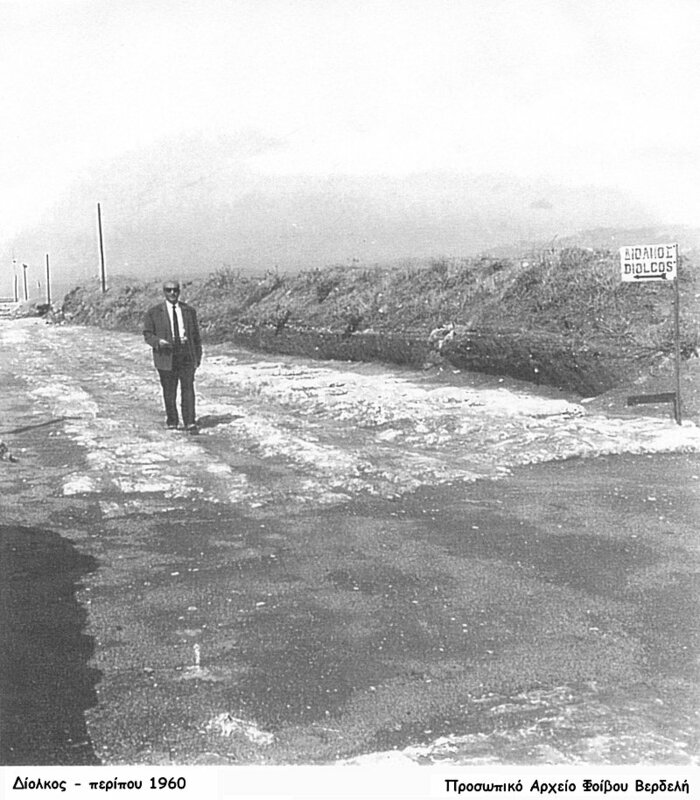 In 1975 a second road bridge was built to ease the increased volume of traffic. Most reliable yacht charter firms will arrange all paperworks for your crossing through the canal. Instead of sailing the Corinth Gulf, there is the option of sailing around the Peloponese peninsula - compare the northern (Corinth Canal) route and the southern route. 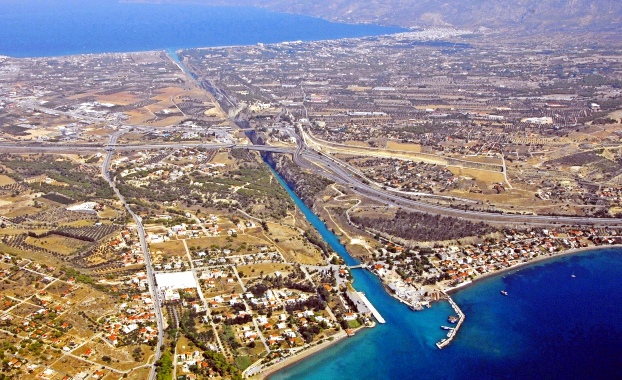 ↑ Aerial photo Corinth Canal north. 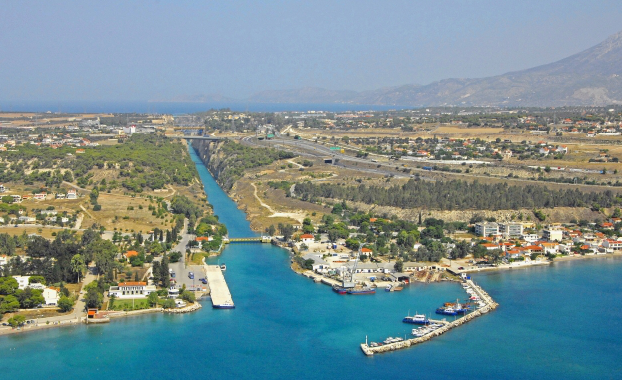 ↑ Aerial photo Corinth Canal south. 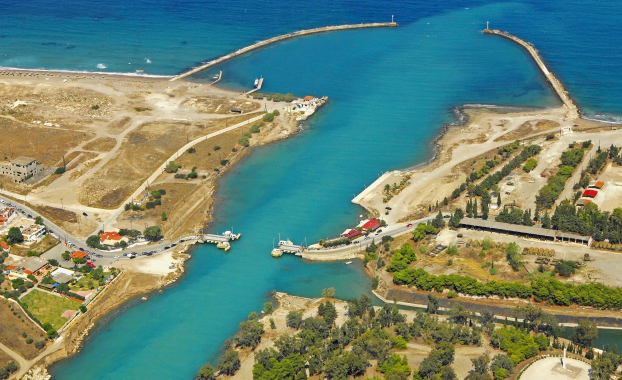 ↑ Aerial photo Corinth Canal.